The “Protection of Minors in the Church” Meeting concludes with a Press Briefing in the Vatican and the announcement of concrete commitments and initiatives to protect children, and to combat abuse. There have been four Press Conferences, coinciding with the four days of the Meeting. Each one has provided a synthesis of the day’s discussions and reflections, and allowed journalists an opportunity to engage with participants and speakers in what was often a lively Q&A session. One implicit (and explicit) question underscored the concluding press briefing on Sunday: “What now”? Expectations were high, especially given Pope Francis’ mandate to participants, at the start of the Meeting, to come up with “concrete” initiatives to help the Church in protecting minors. 2. 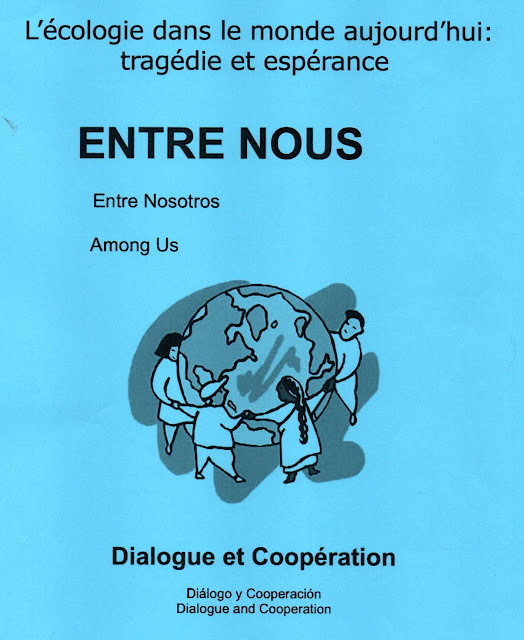 The distribution of a “vademecum” (or rulebook) to Bishops around the world, explaining their juridical and pastoral duties and responsibilities with regard to protecting children. 3. 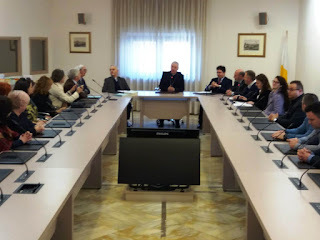 The creation of an operative “task force”, comprising competent experts, to assist those Bishops’ Conferences that may lack the necessary resources or expertise to confront the issue of safeguarding minors, and deal with abuse. 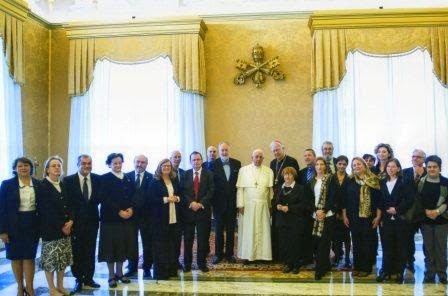 The “Protection of Minors” Meeting in the Vatican has received extensive coverage throughout the media over the last few days. The Prefect of the Vatican Dicastery for Communication, Paolo Ruffini, acknowledged as much when he thanked journalists for their work. 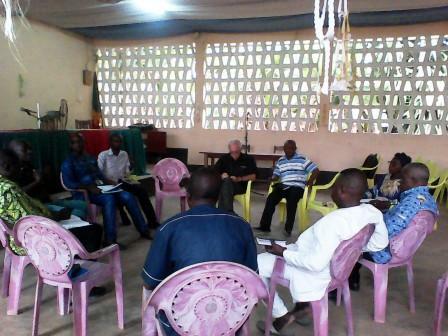 He stressed the role of journalists as that of “searching for and reporting the truth”. He spoke of the importance of “listening without prejudice”, and confirmed how “there can be no communication if everyone is talking and no one is listening”. Ruffini, and others on the panel at the Press Conference, praised Mexican journalist, Valentina Alazraki, for her “courageous” contribution to the Meeting on Saturday, when she addressed the Bishops on the theme of transparency: “Communication to all people”. 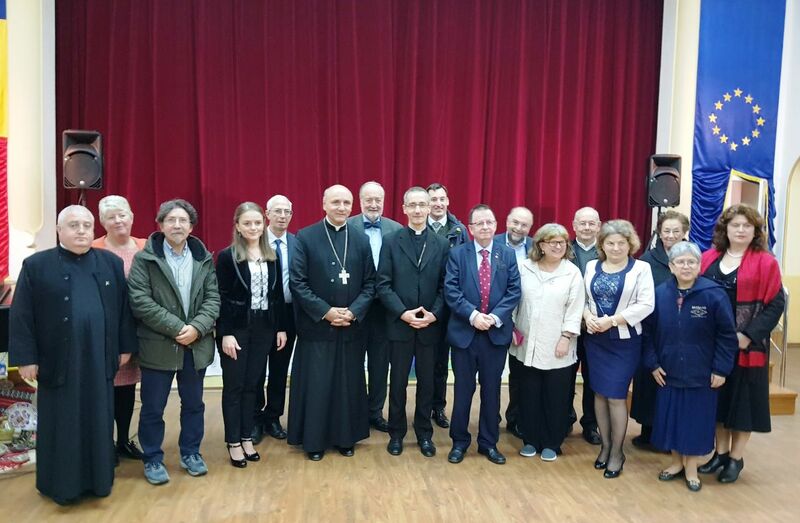 Addressing the Press Conference, Valentina Alazraki encouraged “working together with the Church” on this issue, but reminded the Bishops never to say “no comment”, and to be sure to provide media with “timely and fair information”. Asked for his take-away on the “Protection of Minors” Meeting, Cardinal Oswald Gracias, Archbishop of Bombay, called it “timely, useful, and necessary”. 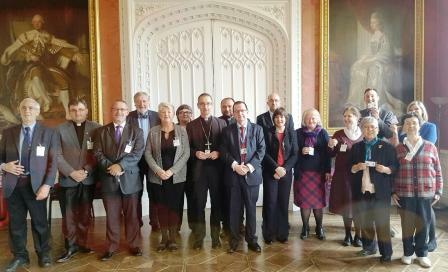 He and his brother Bishops, he said, came away with a universal understanding and consciousness that confronting the problem of abuse is “a priority for the Church”. He also praised the contribution of women at the encounter, highlighting the value of their “feminine insights and perspectives”. Archbishop Charles Scicluna of Malta provided his own “flashbacks of these four days”. He said he was struck by the Holy Father’s concluding speech and his clarity, defining both abuse and cover-ups as “egregious crimes”. “There is no going back”, said the Archbishop. 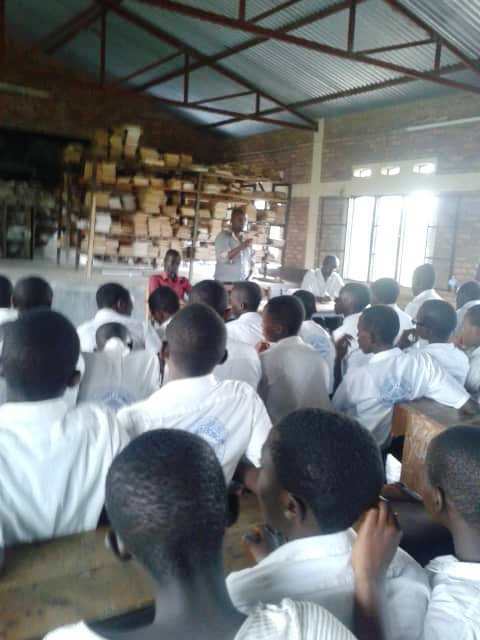 He also said that the presence of victims-survivors was a vital part of the experience. “We cannot not listen to victim-survivors”, he added. Archbishop Scicluna stressed how “at the end of the day, it is a change of heart that is important”. We need the right motivation and, for that, we need to listen to different voices – including those of women, who (in the case of this Meeting) provided a “breath of fresh air”. 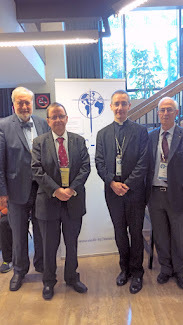 Jesuit Father Hans Zollner, is a member of the Organizing Committee and Head of the Centre for Child Protection at the Pontifical Gregorian University. He spoke of a “qualitative and quantitative leap along a decade-long journey that will continue”. Attitudes have changed, he said, and people have been transformed: they are determined to “go back home and do something about it”. Right now, concluded Fr. Zollner, “we need to focus on what we have done here” at this Meeting in the Vatican, and to tackle “the systemic roots of the problem”. These, the themes of the three days of the Meeting, reflect both the problem and the solution: Responsibility, Accountability, and Transparency. Les cahiers de culture de paix que nous avons pu produire sont d’une importance capitale pour le développement intégral de l’enfant. Ils aideront l’enfant à avoir un œil ouvert, un regard empathique, un cœur sensible et une main prompte à l’action en faveur de l’homme et de tout homme. 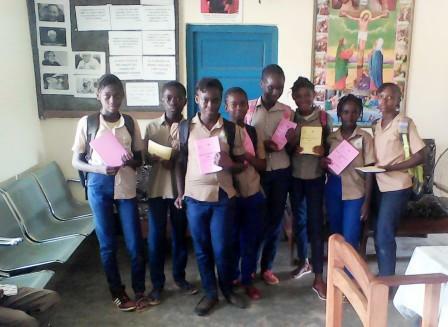 Nous utilisons ces cahiers dans la pédagogie participative où les enfants travaillent en groupes et élaborent des stratégies d’action d’abord en eux-mêmes, en famille et en milieu scolaire. Les parents ont adhéré à cette démarche et cela se justifie par le fait qu’ils font des photocopies de ces cahiers pour leurs enfants. Ce qui démontre un besoin permanent de ces cahiers. 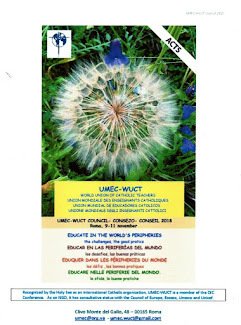 Les cahiers on été preparé grace à l'aide de la Fondation Papale et de l'UMEC-WUCT. The Keynote Speaker is Prof. Dr. Clarita DL Carillo, Assistant to the Rector for Planning and Quality Management. Among the attendees on March 9, 2019, Saturday at the Lourdes Custodio Hall, ground floor, College of Education, St. Albert the Great building , University of Santo Tomas are some 120 public school teachers from the various districts of Quezon City. 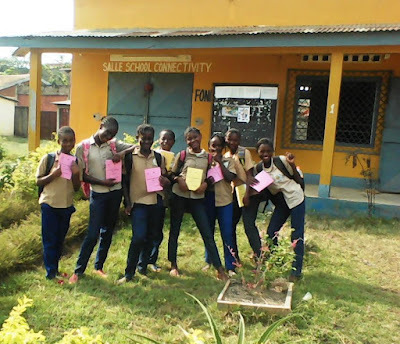 Teachers from Parochial Schools are also expected to attend. 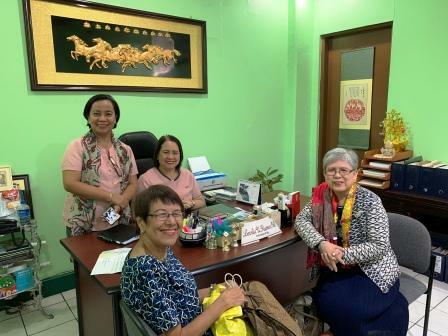 Photos show Dr. Tangco( right, seated) with CTGP National Board Councilor Ms. Petronila Garcia (retired Supervisor of Schools in Quezon City, left, seated), Ms. Gloria V. Bien(standing), Head Teacher VI on Values , ( Ramon Magsaysay High School, Cubao, Quezon City), and seated, center, is the Principal Dr. Levita U. Ramos, in preparatory talks about participants. Photo below shows Dr. Tangco,Ms. 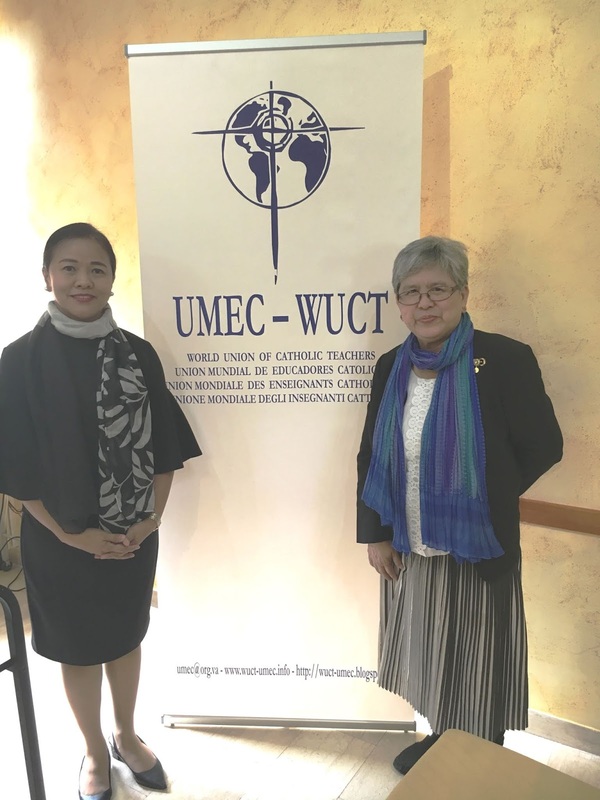 P. Garcia, Ms. G. Bien , with Supervisor for Education Program Ms. Marietta S. Caballero. 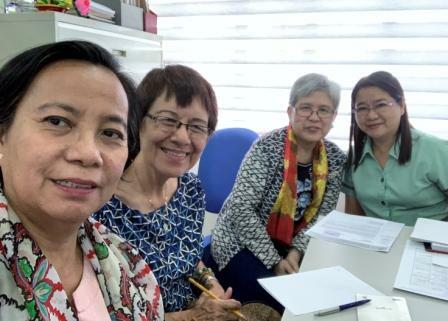 They discussed details on participants and planned for April 2019, a 3-day Seminar-Recollection for a much bigger number of Teachers. Dr. Belen L. Tangco , OP (right) , CTGP President, takes pride in the Keynote Speaker. 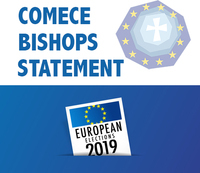 European Bishops are publishing today the statement “Rebuilding community in Europe”, calling all EU citizens to engage in the political process, to exercise their discernment and to vote at the 2019 European elections, further building together the European project. Les évêques européens publient aujourd’hui la déclaration « Reconstruire la communauté en Europe », appelant tous les citoyens européens à s’engager dans le processus politique, à exercer leur discernement et à voter aux élections européennes, afin de poursuivre ensemble le projet européen. 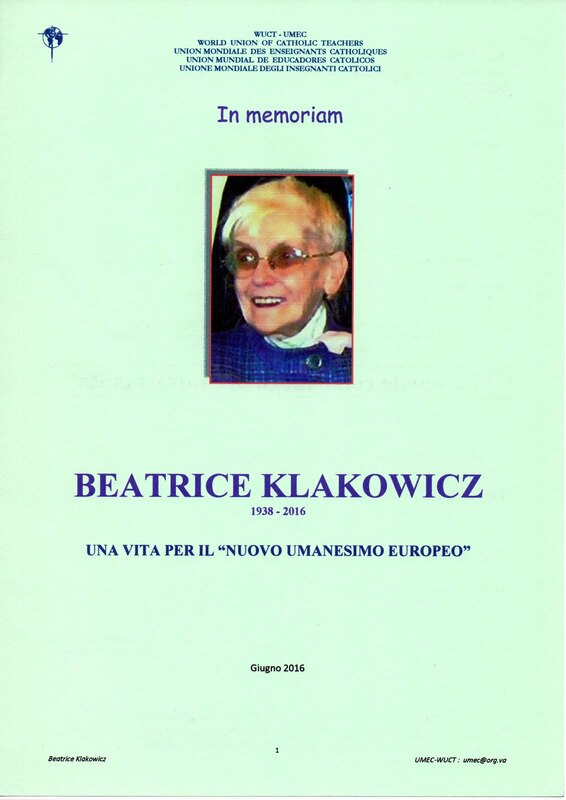 Europäische Bischöfe haben heute die Erklärung „Wiederaufbau der Gemeinschaft in Europa“ veröffentlicht, in der alle EU-Bürger dazu aufgerufen werden, sich aktiv am politischen Prozess zu beteiligen, ihre Urteilsfähigkeit zu üben und ihre Stimme bei den Europawahlen 2019 abzugeben, um das europäische Projekt gemeinsam weiter auszubauen. Samedi le 9 février l'Action Évangélique pour la Paix , la Commission Justice et Paix et les équipes enseignantes se sont rencontrer pour réfléchir sur la mise en place d'une plateforme oecuménique pour le travail pour la justice et la paix dans les departements de la Sangha et Impgindo. Étaient présents à cette rencontre Monseigneur Yves MONOT,évêque de Ouesso, le pasteur Gaston de l'église Évangélique et un chrétien représentant l'Armée du Salut et les membres de la Commission Justice et Paix, l'Action Évangélique pour la Paix(AEP) et les Equipes Enseignantes. Après de brillants exposes , tout le monde a opté pour la mise en place de cette plateforme. 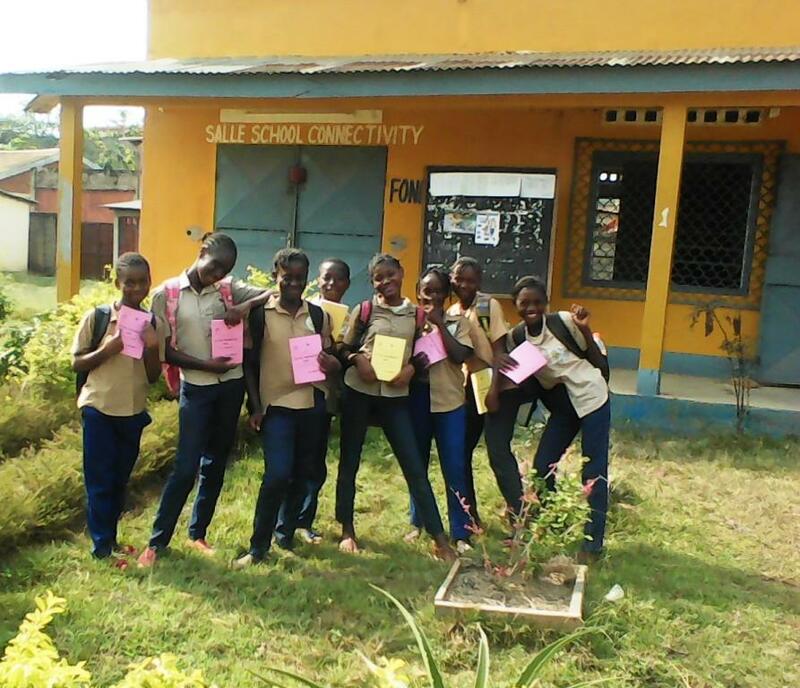 Ainsi il a été mis en place trois personnes de contact : Abbé Benjamin, le Pasteur Gaston et Pelage UWIMANA. 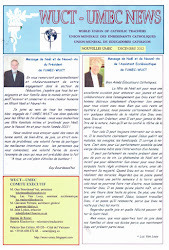 Prochaine rencontre le 10 mars à l'église Évangélique. multirreligiosas concretas en la región. islámicas e indígenas de América Latina vienen reuniéndose en el Consejo Interreligioso Latinoamericano de Educación para la Paz (CILEP), bajo la convocatoria de Religiones por la Paz América Latina y el Caribe, para poner en diálogo, mediante el encuentro fraterno, sus saberes, experiencias y recursos en la construcción de una cultura de paz en ámbitos educativos religiosos de la región. Consciente de la enorme crisis ética que acompaña a la persistente corrupción en la región, así como su afectación a la convivencia democrática, componente clave de toda cultura de paz, el CILEP está promoviendo un esfuerzo articulado de las organizaciones educativas religiosas que apunta a promover los valores de la honestidad, la confanza y el respeto, y a fortalecer el discernimiento ético para generar comportamientos individuales y colectivos basados en la integridad. 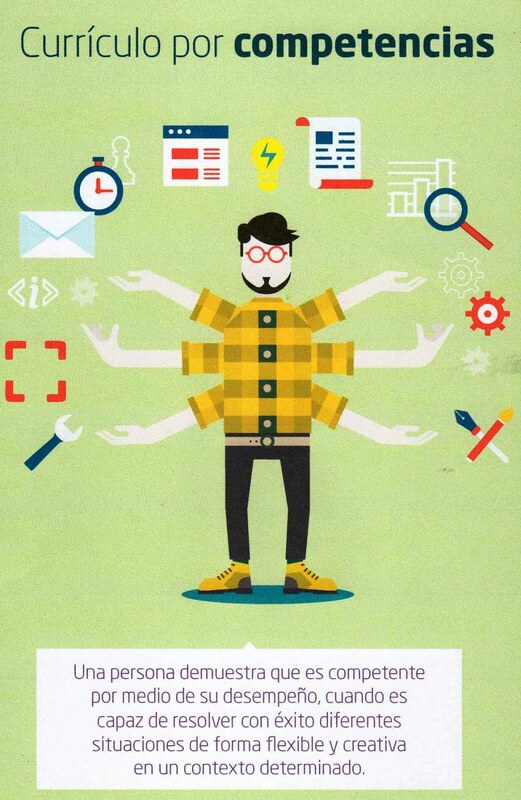 Las instituciones educacionales inspiradas en la fe están convocadas a liderar esta tarea y, de este modo, a contribuir a la regeneración moral de nuestras sociedades. La construcción de una cultura de integridad necesariamente se inicia con la educación de los jóvenes. El conocimiento, las habilidades y los comportamientos que puedan adquirir en sus establecimientos educativos darán forma al futuro de la región. Como parte de los sistemas educativos de nuestros países, la participación de las instituciones educacionales religiosas es fundamental para inspirar normas de integridad pública a una edad temprana. Los currículos escolares religiosos deben involucrar a los jóvenes en un diálogo y una exploración permanentes sobre cómo ellos, como ciudadanos, pueden proteger la integridad pública. La educación para la integridad pública debe inspirar un comportamiento ético entre los jóvenes y equiparlos con los conocimientos y las habilidades para resistir la corrupción. La fragilidad del discernimiento ético que ha conllevado a gravísimas tragedias a lo largo de la historia, también está estimulando los comportamientos reñidos con la integridad que generan la corrupción que actualmente enfrentamos. Sus razones están en primer término, en la difcultad de entender la complejidad de la realidad, lo cual lleva a una mirada simplista de las cosas. Una segunda causa es la escasa conciencia del derecho del otro y del deber propio, debido a un individualismo pragmático muy extendido. Y, en tercer lugar, la crisis de la familia, caracterizada por padres ausentes, la carencia de comunidad para gran parte de la población y el desprestigio de las instituciones públicas que han provocado una desatención de la educación en valores desde la familia, la comunidad y el Estado. A ello, se suma un discurso religioso que, en ocasiones, parece desconocer los problemas reales que viven las personas. Como consecuencia de toda esta situación, se ha agudizado el círculo vicioso de las medias verdades, de la desinformación (posverdad) y de los aprendizajes negativos que los niños, niñas y adolescentes reciben en el espacio público. Haciendo frente a este escenario, el CILEP alienta a las organizaciones educacionales inspiradas en la fe a desarrollar programas educativos que promuevan la capacidad de discernimiento de los problemas, tanto individuales como colectivos, empleando su propia ética religiosa, de modo que se alienten comportamientos basados en la integridad, entendida como una convivencia fundada en los valores de la honestidad, la confanza y el respeto. 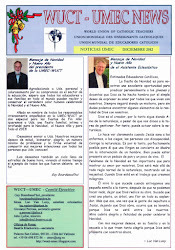 Con el propósito de impulsar el desarrollo de estos programas educativos, Religiones por la Paz América Latina y el Caribe presenta esta publicación “De la cultura de la transgresión a la cultura de la integridad. Aportes para la enseñanza de la ética pública en las escuelas religiosas de América Latina” que esperamos se difunda extensamente entre las instituciones educaciones religiosas de la región. 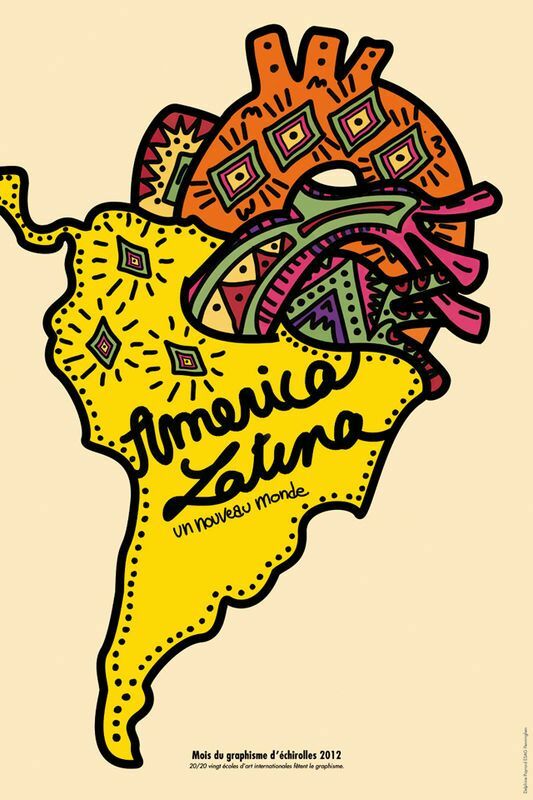 En nombre de Religiones por la Paz América Latina y el Caribe, me gustaría reconocer a las muchas personas y organizaciones que apoyaron la elaboración de esta publicación. Dall'uno al sette febbraio una trentina di insegnanti della Scuola greco-cattolica della Diocesi di Oradea sono a Roma, ospiti dell'AIMC, per la seconda fase dello scambio culturale tra insegnanti italiani e insegnanti rumeni. La prima fase è stata realizzata lo scorso novembre quando un gruppo dell'AIMC è stato in Oradea. 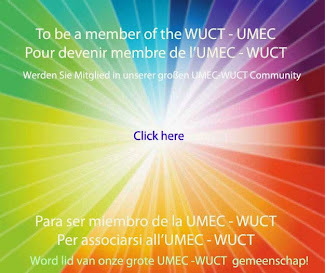 Lo scambio avviene nell'ambito degli scambi tra varie scuole del mondo promossi dall'UMEC-WUCT. - visita a luoghi significativi di Roma. 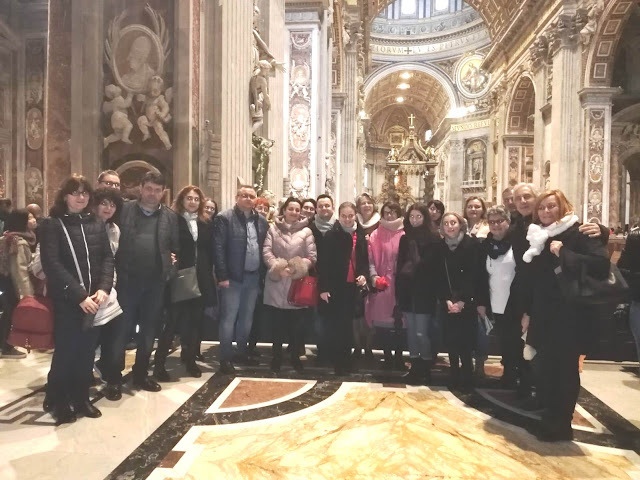 From one to seven February, about thirty teachers from the Greek-Catholic School of the Diocese of Oradea are in Rome, guests of the AIMC, for the second phase of the cultural exchange between Italian teachers and Romanian teachers. The first phase was carried out last November when an AIMC group was in Oradea. 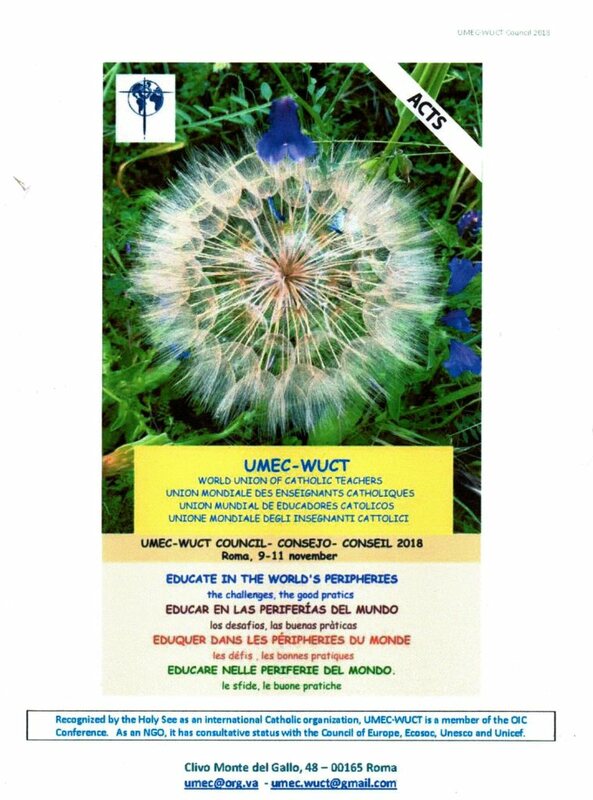 The exchange takes place in the context of exchanges between various schools in the world promoted by the UMEC-WUCT. - visit to significant places in Rome. 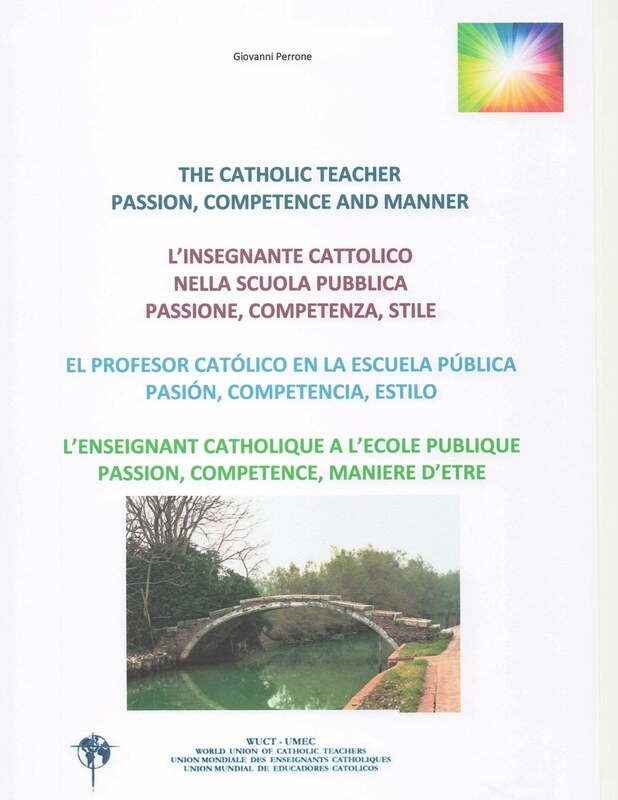 Du 1er au 7 février, une trentaine d’enseignants de l’école catholique gréco-catholique du diocèse d’Oradea sont à Rome invités de l’AIMC pour la deuxième phase de l’échange culturel entre enseignants italiens et enseignants roumains. La première phase a eu lieu en novembre dernier, lorsqu'un groupe AIMC était à Oradea. L'échange se déroule dans le cadre d'échanges entre différentes écoles du monde promu par l'UMEC-WUCT. 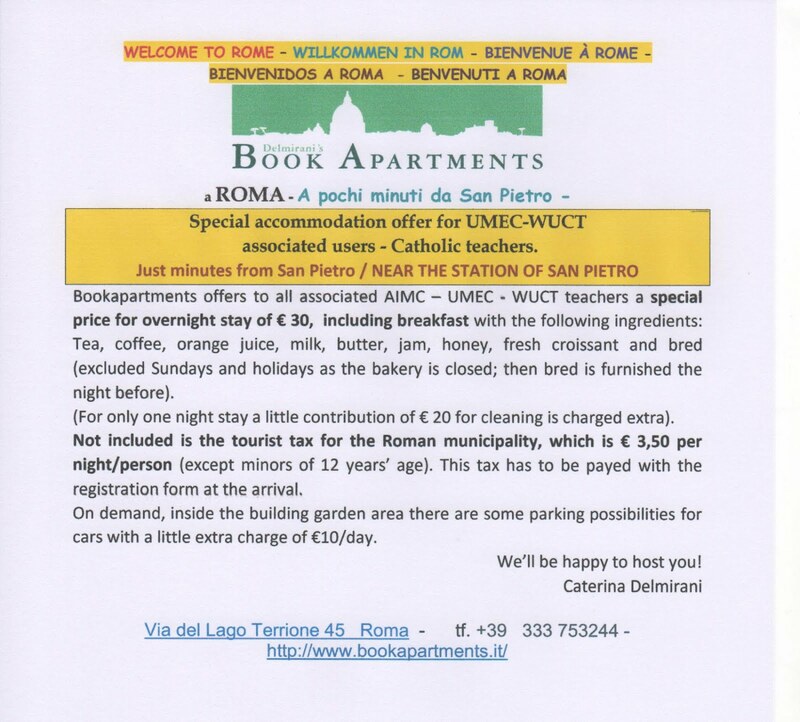 - visite de lieux importants à Rome.